Good preparation can maximise your opportunities at job fairs. Stand out from the crowd using these six steps to improve your chances of finding a job. Job fairs and career expos are popular events for job hunters, although job seekers need to ensure they maximize their opportunities when meeting recruitment agencies and potential employers. A job fair can be a great place to boost your profile while meeting fellow professionals in your field, so make sure you prepare in advance to ensure you’re one of the lucky candidates. Here are six things to do before attending a job fair. Large job fairs often provide a list of exhibitors and speakers that will be present on the day of the fair. Make sure you study this list and visit their websites to get a better picture of who they are, what they are offering, if it’s suitable for you, what type of candidates they are looking for, and perhaps prepare a few key questions you would like to ask them on the day. There will be many companies present at the event and not all will be suitable for your career path. Optimize your fair time by preparing a list of which stands you would like to visit and rule out those that do not suit your expertise or experience. In doing so, your time will be more focused, allowing more time to talk to the companies that matter to you. A curriculum vitae (CV for short) is a jobseeker’s vital tool, often rush-written by the unemployed. This document acts as a reminder to recruiters and employers of whom they met on the fair day and who made a lasting, positive impression. Ensure that your CV is up-to-date, clearly presented, and well-written. Some job fairs enable you to submit your CV prior to the event; if not, make sure you take plenty of printed copies with you. Think of it as your business card to give to the recruiters you meet at the event. Keep in mind that exhibitors are likely to have spoken to many potential candidates by the end of the day and will have several CVs to look through. Consider what you can include in your personal statement to ensure yours stands out from the rest. Some recruitment events also host CV workshops, providing advice on how to write and use your CV effectively in the local job market. Sessions like these can help tailor your CV for the local job market. Recruitment fairs offer the ideal chance to network, which is a valuable job-hunting source in any country. Don’t be afraid to introduce yourself to new people, exhibitors, and even other job seekers. Even if there’s no immediate job opportunity, the contacts you make at a job fair might be important in the future. Ask for business cards whenever you can. That way, you save the details of relevant contacts – who you know still plays an important role in some countries. Asking insightful questions allows both the employer and the job seeker to gain greater awareness of each other’s characteristics. Dress comfortably but professionally – you should come dressed in interview wear. Speaking to employers at such events can be seen as introductory interviews; bear this in mind when choosing your outfit. Wear something you feel confident in to complement your confident attitude when introducing yourself to recruiters. Comfortable footwear is a must. Consider that you will be on your feet for the majority of the day and bandages peeking over socks could be seen as a sign of poor preparation. Many job fairs often host presentations throughout the day. These are often delivered by members of the exhibitors’ teams and/or guest speakers. Study the program before attending the job fair to ensure you do not miss any talks that could boost skills in the areas you are lacking. Make note of where they are being held and arrive with plenty of time to spare. Arriving late will not only lead to you feeling stressed, but it could also be noticed by the speaker. 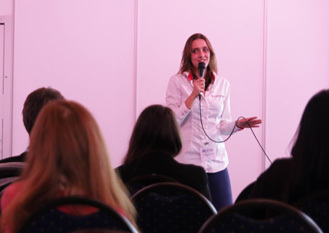 Presentations and workshops often provide advice about the exhibitors’ stands, personal development, how to be successful, how to write a successful CV, how to use social media networks such as LinkedIn to increase your chances of finding employment, and much more. It pays to look at these: you may be surprised and discover that you might not have all areas covered. The speakers will often use the final few minutes of their time slot to invite the audience to ask questions. Make sure you note down any pressing questions during the presentation; this way, you can ask informed questions with confidence when question time begins. Make use of your newly-expanded contact list by reaching out to your professional network. Keep in touch with your contacts by phone, e-mail, or LinkedIn. You’ll ensure you remain fresh in their mind, particularly if you submitted an application for a potential job opportunity. When they consider candidates for a vacancy, you will increase your chances of being invited for an interview. Effective and creative communication is often the key to success, so good luck on landing your dream job. Young, single, new job, new country? Why leave your current job for an overseas opportunity?